We would like to welcome everyone back after the holiday’s. Hope you all had a lovely Christmas and new year. We would also like to give all our new children and parents a warm welcome. Everyone is settling in well and we are looking forward to getting to know them this term. I have introduced story scribing to the children and it has been a great source of interest so far. 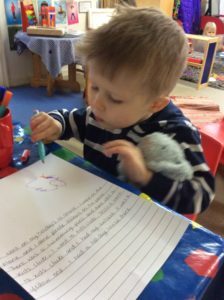 Children are encouraged to talk about something of interest to them or to make up a story using their imagination, the teachers then scribe their words. We have had lots of varied discussion after the Christmas holiday’s, you may have noticed some of these displayed on the walls around nursery. 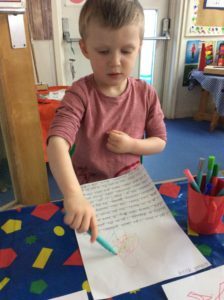 They have also had a go at collaborative writing where they take turns to add parts to a story created together in a group. 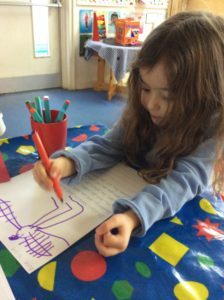 These tasks are great for encouraging literacy and language and builds confidence in this area. It is also great for expanding vocabulary. When they become familiar with these concepts we plan to start introducing helicopter stories. This involves acting out what they have wrote about with the authors being in charge of choosing their friends to be the characters in their own story. 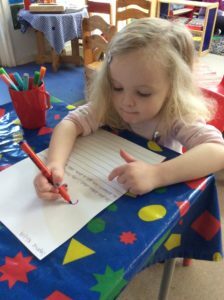 We look forward to watching their literacy skills develop.